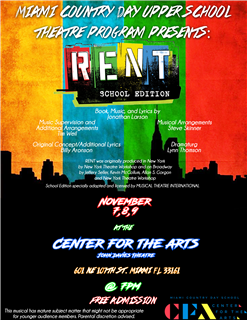 Miami Country Day School | Rent the Musical Opens November 7th! Rent the Musical Opens November 7th! Miami Country Day School’s Upper School Theater Program presents Rent The Musical School Edition. They will be performing at 7 pm on November 7,8, and 9 in the John Davies Theater at the Center For the Arts! Free Admission! All are welcome! Come out and support our thespians! Characters in the musical Rent struggle to find meaning in their lives while leaving a legacy behind. Each of them must learn to live each day as their last because "There's No Day But Today."